"Creative work is play. 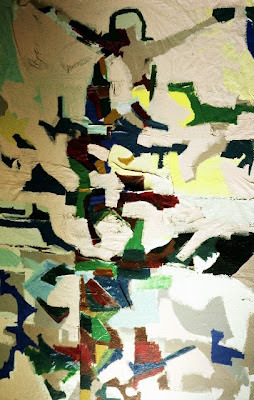 It is free speculation using the materials of one's chosen form." The last day of June is here. For nine days the nights have been getting longer again. No biggy. It's summertime and we're going to get some nice weather this Fourth o' July weekend. Not sure what your plans are yet? There's music and there are movies... and there's the arts. In fact, there's so much happening I missed the Park Point Art Fair last weekend. Durn. Studio 15 always has something happening, including a wine and painting gathering tonight, and tomorrow night's opening reception for POMME DE TERRE ("Half Baked) featuring work by Eris Vafias and her circle of friends. The gallery is at 3rd Avenue West half way up from Superior Street just below the alley. The new Lakeside Gallery just opened last week. I've promised myself that I would check it out sometime soon. 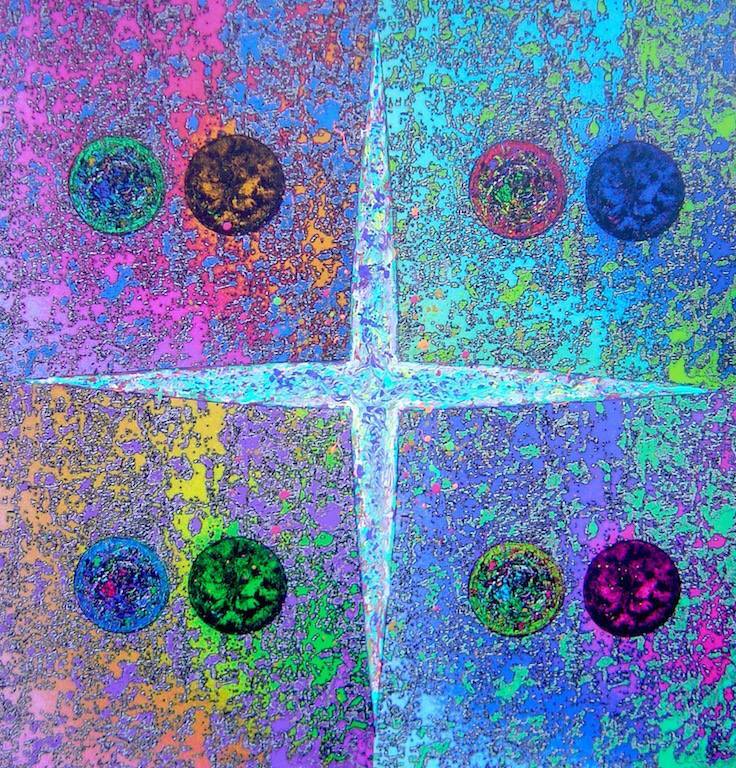 Good luck to Aaron Kloss, a local artist who has successfully created a following here and is now dedicated to helping other artists get their work out for a wider public to see. TONIGHT is the Free monthly talk at the Glensheen called Zenith City on Tap. I've been thinking that events like this would make a great "date night" activity. 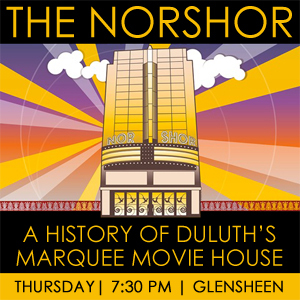 The theme for tonight's talk is "The NorShor: Duluth's Marquee Movie House." The talk wiill be given by Duluth historian and Zenith City Press publisher Tony Dierckins whose original claim to fame was his Duct Tape book. 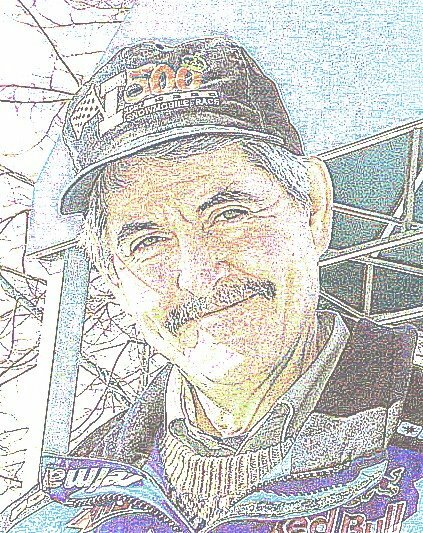 Today his website is a rich resource for Northland historians. Tony will present the history of the 1941 Art Deco movie house, which is about to undergo a $30 million restoration. He'll also share stories of the two theaters that preceded it at the same location: the 1910 Orpheum vaudeville house and the 1889 Temple Opera House. The event is free even if the beer is not. I'm confident it will be memorable. Starts at 7:30 p.m.
Minnesota Public Radio has announced that they are seeking artwork for a special 50th anniversary commemorative calendar. There is a $2500 prize associated with this. In addition, one of our own will assist in the judging, Duluth Art Institute director Annie Dugan. She has not yet indicated whether she can be bribed or not. Submissions will be due in September. Details here. In addition to my most recent painting, “Tribute to the Ayotzinapa 43…,” (remembering the 43 indigenous rural college student teachers missing and murdered in Iguala, Mexico one year ago, amidst their protests against systemic governmental inequities especially for rural education and land rights. )…I’ll be featuring a small selection mixed media abstract paintings inspired by Sharon's and my travels to Central and South America, particularly life changing trips to Cusco - Machu Picchu, Peru, and San Cristobal de las Casas, Chiapas, Mexico. Read more here and mark your calendars. In an event related to Tim White’s current In and Out of Context exhibition at the Duluth Art Institute, which features the words of 21 regional wordsmiths paired with White’s black-and-white photography, “21 Poets/21 Seconds” will take place from 7 – 9 PM on Thursday, July 7. 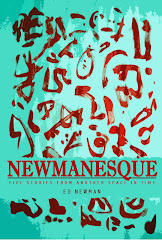 The event will put an irreverent spin on the sometimes solemn proceedings of conventional poetry readings, giving each participating poet just 21 seconds to share their words, conveying sharp insights or droll humor in less than a minute’s time. What I'm curious about is the selection of the numeral 21. In the game of Blackjack, 21 is the number. I doubt Tim White's encouraging gambling here. He did perhaps take a gamble in coming to Duluth, appearing seemingly out of nowhere, and quickly establishing himself here on the merits of a strong piece in the magazine Black & White. Black and white photography is his medium at this point in time, sometimes crisp and vivid and often ambiguous. He's certainly played a good hand with his current exhibition pairing art photography and poetry. I recommend checking it out. When the weather is fabulous, get out and enjoy it. 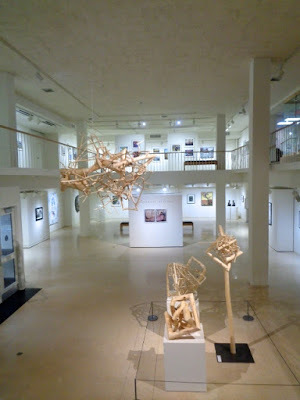 But when it's prohibitive, check out the Tweed, the Duluth Art Institute, and our multitude of local galleries. There's always more to see and do than you'll have time for. If you have a special someone to share it with, that's even better. Every artist has a story, and it's been fun learning more about the members of the band that will be performing here at Weber Hall, UMD this coming month. 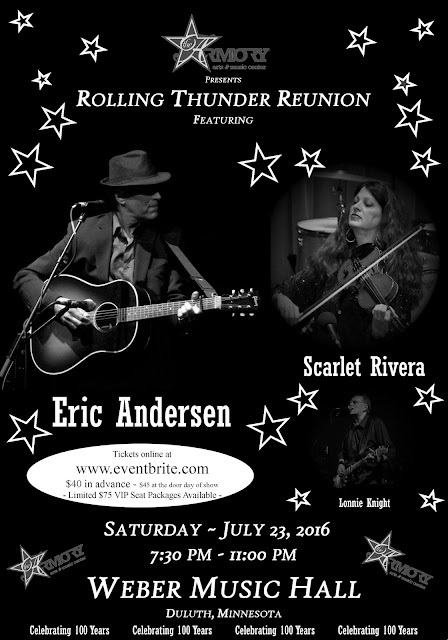 Saturday July 23 the Rolling Thunder Reunion will be rolling into town with a show featuring Eric Andersen and Scarlet Rivera, accompanied by Steve Addabbo and Cheryl Prashker. Lonnie Knight is on the docket to kick things off. Eric and Scarlet performed together with the Dylan entourage when the Rolling Thunder Revue kicked off its legendary tour at Gerde's Folk City in New York, 1974. Now, they are bringing it all back to Dylan's original home town with a reunion concert in Duluth. 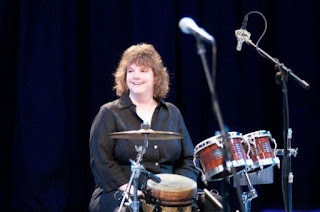 According to her media bio, Cheryl Prashker studied classical percussion at McGill University in Montreal, Canada, where she was born and raised. 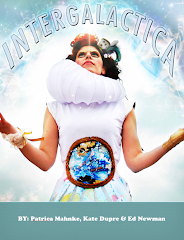 She has toured Canada, U.S. Europe and Russia with The Yiddish Theatre of Montreal. She spent many years in New York City where she honed her skills of playing anything from Rock and Roll, Klezmer, to Celtic as well as Middle Eastern music. She now uses her special style of percussion to enhance the music of such artists as Jonathan Edwards, Pat Wictor, Tracy Grammer, Full Frontal Folk and her group RUNA. Cheryl is also a songwriter and President of NERFA (Northeast Regional Folk Alliance). I've interviewed artists of all kinds over the years, but this is my first time interviewing a drummer. I learned a lot. EN: How did you first get into drums? 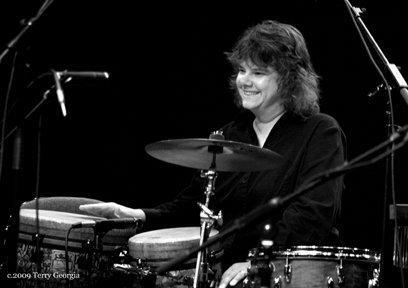 Cheryl Prashker: Ever since I was a young kid it’s all I ever wanted to play. I tried piano at a very young age as my mother was a piano teacher but I did not take to that. I tried guitar but again, it was not what I wanted at the time (I do play guitar now and continue to write my own songs.) I finally got to play drums in music class and eventually school band only starting in grade 7. I am from Montreal, Canada, and at the time, there was no music in the elementary schools as there is now. I was extremely shy so being in the school band was tough… I definitely got over that. All I ever wanted to be was a rock drummer and I eventually got to have a set of drums at home. I did not have a private teacher while in high school, so I taught myself and played along to many records from such as artists as The Byrds, Boston and Fleetwood Mac. EN: What kinds of things did you learn from studying classical drumming that you may not have learned otherwise? CP: I am blessed to have had the classical training that I received at Vanier College and McGill University in Montreal. As far as I am concerned, it’s the best thing any musician can do for themselves. It is invaluable. It teaches you literally from the ground up. Percussion/drum students have to do all the technique work like rudiments etc. It’s like doing scales on the piano. It keeps your hands even and as a drummer that is what you strive for. It also gave me music reading capability of both regular music as well as drum music and that can open the door to so many more jobs in the music industry from musical theatre to recording work. As a percussion student, you learn all the mallet instruments like the marimba and vibraphone. As well as timpani, which strengthens your ear as well as hand technique. And of course, working in an orchestra or concert band under the direction of a conductor teaches you how to take direction and work with other musicians which translates into so much in this world. EN: I recently wrote a blog post about Ringo of the Beatles assessing where he stacked up as a drummer. Who have been your own favorite drummers? CP: I am a huge Beatles and Ringo fan and admire everything about him. Including that he writes songs as well. Being an 80’s kid, I was always a big Phil Collins fan. I have seen him in concert with Genesis a few times and it is always a treat. I love the showman in him and I have adapted the showman part when I perform. Being from Canada, it is a requirement for every drummer to be a huge fan of Neil Peart from Rush, which I am of course. But interestingly enough, what influenced my drum set playing was mostly an unknown drummer from the 80’s band Big Country, Mark Brzezicki. His use of the high-hat and snare drum was very much like rudimental/military drumming and I love that sound and feel my drum set playing is very influenced by his sound. EN: What makes your own drumming style distinctive? CP: Given what I do a lot now, which is accompany singer-songwriters, I have found that full drum set players have a hard time playing quietly enough to accompany these writers who are primarily on vocals and guitar. So what I have done is put together a small set up of a djembe, bongos on the side, a cymbal I play with my hand, a tambourine on the floor that I play with my left foot and a set of chimes. (Those are to make people smile!) It really is a kind of small drum set-like set up. I don’t focus on being the loud back beat that artists follow, but rather more of the “color” that surrounds and accompanies the song. I focus on the lyrics at times and play off the main instrument which is usually a guitar. I feel this is better for the main artist and I have also found that the audience appreciates it much more than a full drum set player and it opens their ears and eyes to a different “drumming” sound. EN: In the age of drum machines and digital everything, why are human drummers still relevant? CP: That is such an important question. As of course, not only drum machines but now, for live shows the “Stomp Box” which is basically like hitting a bass drum on every beat. Sure, using those means for recording or live concerts will give you an exact and constant beat. But a live drummer gives you warmth in their execution as well as feeling. In a live show, it’s also about the visual and there it is unbelievably exciting watching an amazing drummer do their thing. There is nothing like a real drummer and I know everyone understands that. In today’s world of recording and live shows, it sometimes does come down to being able to afford to have a drummer come in. EN: How did you connect with Eric and Steve? How long have you performed with these guys? CP: It is a fun story which I adore telling. 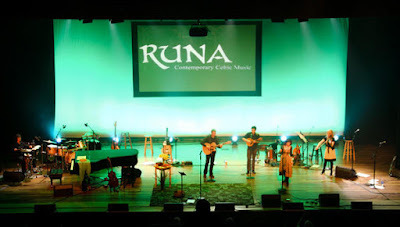 I was playing with my own Celtic Roots Music group RUNA at the Mariposa Folk Festival in Orillia, Ontario last July. We were on a small stage doing a workshop on the stage that Eric had just played on. I had seen him in concert before and knew who he was of course. He was behind the stage talking with Sonny Ochs and he noticed the drum set up I was using for the workshop and seemed to be quite curious. He walked over to the side of the stage and gave me the once over! After we were done playing, Sonny brought me over and introduced the two of us. We hit it off and started talking about just about everything immediately including the fact that he had been in Montreal, where I am from, visiting with Leonard Cohen many times before. Later that night, we were back behind the main stage and we continued our conversation. I somehow talked Eric into attending the Northeast Regional Folk Alliance Conference which takes place in November. I am the President of the Board and help out putting the workshops together. 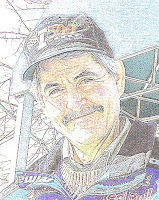 I thought he would be perfect for a program we have there called “The Wisdom of The Elders” where Sonny Ochs interviews the amazing artists we have among us who are steeped in rich history. Now while we were there talking, Steve Addabbo was also backstage as he was playing guitar for Eric that weekend. I had never met Steve before. At one point Eric says to Steve, “I think I would like to have Cheryl go into the studio and record some percussion on the song called Singin’ Man. Steve, can you make that happen?” Steve was the recording engineer who was working on that CD project. Steve replied saying that the song and the project was finished and that it would not work out this time. And the two of them went back and forth about me recording for that song. Eventually Steve was kind enough to make it work and we had a blast in the recording studio. I absolutely adore Steve Addabbo and can’t wait to work with him both live and in the studio again. Since that amazing meeting last July the 3 of us have played many shows throughout the Northeast as well as a few showcases at Folk Alliance Conferences. I have also recorded again for Eric on his recording on the works of Byron that will be released this summer/fall. I am blessed to have met both of these amazing artists as they have enriched my life and music greatly. The concert is July 23. You can purchase tickets here at EventBrite.com. Meantime, life goes on all around you. We'll see you there. I've been reading the book What Should We Be Worried About? 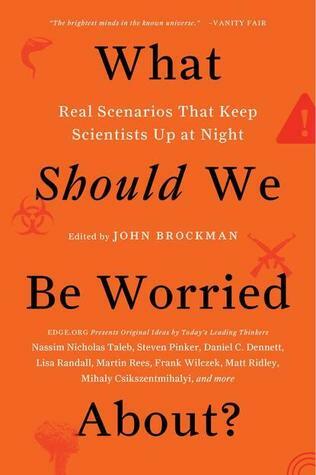 with the subtitle, "Real Scenarios That Keep Scientists Up at Night." Even though we're well-aware of the saying that 95% of what we worry about doesn't come to pass, we still tend to worry. One thing I never worried about though has been killer bees. Over the years, and it seems like decades, there have been a lot of stories about these little monsters. Until this past week I never read beyond the headlines, always assuming it was a hyped up concern that helped sell magazines and newspapers. When I came across an anecdote about killer bees in a book I was reading I decided to arm myself with a little more information so that I wouldn't be so ignorant the next time this topic came up during a dinner conversation. I had no idea. Killer bees were the result of the law of unintended consequences. Scientists decided to create a hybrid bee by cross-breeding a Western honey bee with an African honey bee. 2) The Killer Bees were introduced to Brazil in the 1950s with the noble goal of increasing honey production. It wouldn't surprise me, though, to learn that these scientists just wanted to see what would happen. "Let's try honey bees with Italian bees to see if they like spaghetti." Eventually they tried African bees, and it produced this new hybrid bee breed. This new "Africanized" bee was brought to Brazil were they were quarantined in an apparently a Jurassic Park-like enclave. Unfortunately, 26 swarms escaped, just like those raptors in the movie. 3) The Killer Bees really are deadlier than regular bees, much like automatic weapons shoot bullets more rapidly than shotguns. I always thought bees die after they sting you. The have a stinger and when it stings you it is left behind in your arm, or ankle, or wherever they's decided to let you have it. Not these bees, though. Killer bees are extremely aggressive once you've stirred their ire. They have a very short fuse, getting pissed 10 times faster than other bees. And they sting you ten times more often than a regular bee. 4) The Bees have been spreading each year and reached the American Northwest in 2011. That's right, these bee hordes crossed the border in 1985 and have been coming north ever since. 5) These Bees have bionic powers and will chase you for up to a quarter-mile. You don't have to be a marathon runner to outrun these bees. They wear little devices that tell them they've chased you "far enough." That is, a quarter-mile. If you run a quarter mile and two steps further you will be safe. 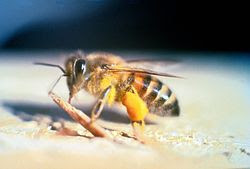 6) Killer bees have killed horses and other animals. Really? If they can kill horses, they can kill your children. And that's scary. 7) They do not like extreme cold or extremely dry conditions. In other words, if you live in the Northland or in the middle of a desert you're pretty safe. I feel better now. How dangerous are killer bees? As with many of the other terrors we're afraid of, most of our fears have been generated by media hype and sensational Hollywood stories. According to Wikipedia, where the information in this blog post came from, there are only a couple deaths a year from these bees. And if memory serves me well, there were deaths by bee-sting long before these Killer Bees appeared on the scene. As I once witnessed in high school: one should not serve chocolate covered bees to people with bee allergies. This, too, can be deadly and is not a very sweet thing to do. Saturday July 23 the Rolling Thunder Reunion will be rolling into town with a show featuring Eric Andersen and Scarlet Rivera, accompanied by Steve Addabbo and Cheryl Prashker. Lonnie Knight is on the docket to get the evening stirred. Eric and Scarlet performed together with the Dylan entourage when the Rolling Thunder Revue kicked off its legendary tour at Gerde's Folk City in New York, 1974. Now, they are bringing it all back to Dylan's original home town with a reunion concert in Duluth. 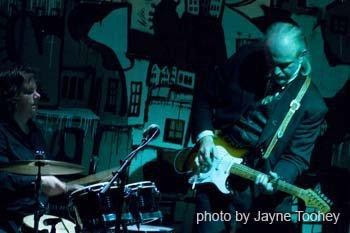 Steve Addabbo has had the privilege of being part of the New York music scene for the course of a lifetme. His career achievements as a mix engineer are impressive, including being tapped to mix Dylan's Bootleg Series #10 "Another Self Portrait" and Bootleg 12 "The Cutting Edge." He's coming to Weber Hall in July as a performer. If the rehearsals are any indicator, this will be a truly memorable night. In 2016 he released his first full-length album, Out of Nothing, with 14 songs written or co-written by him. EN: You grew up in the Bronx and came of age during a really vibrant time in the music scene. What was your career path up till you opened the Shelter Island studio in your basement on the East end of Long Island? Steve Addabbo: I started in 9th grade forming a high school band. We played dances, did the senior show in the auditorium, won a couple of local battle of the bands. Then I went to Stony Brook University as an electrical engineering major and also started taking music courses. I declared a double major in music/engineering my sophomore year. My neighbor (Ron Fierstein) on my dorm hall had a band in Brooklyn, we started writing original material and performing together as a folk duo around campus. We merged the rock band with our acoustic act and formed “Arbuckle”. One of the band members worked for Billboard. He knew of some producers looking to produce a young band..We did our first album at Media Sound on 57th Street NY, opened once for Bruce Springsteen in Philadelphia after his first album (he drew 300 people ). After the band dissolved I toured with my own trio doing clubs in the Midwest., joined a show band ”The Happenings” of “See You in September” fame. They eventually did a recording session at “The Hit Factory” recording studio in NYC. This was when I realized I needed to get a job in a studio and get off the road. With my electronics background the studio hired me immediately as a tech. This was 1977. I later worked for Sterling Sound Mastering and also a small east side studio named Celestial Sounds where I began to do demos and engineer recordings. My ex-band mate Fierstein had gone to law school but wanted to be in the music business. We formed a company AGF Entertainment and looked for a new artist to record and manage. We found Suzanne Vega... Long story short, I co-produced her first two albums. We had a huge international hit with “Luka”. I wound up buying all the equipment from Celestial Sounds and opened up the first version of Shelter Island Sound in the basement of my newly acquired home on Shelter Island. EN: You had the privilege of mixing two of the last three Bob Dylan bootleg series albums. When did you first take an interest in his music? How did this particular project come about? SA: I was musical since the second grade maybe earlier. I played the viola for a year in third grade but it wasn’t until I took guitar lessons about 5 years later that I stuck with it. The Beatles hit when I was in 8th grade and that was it!! The work on the Dylan bootlegs came about through my relationship with the executive producer and former Columbia records A&R man, Steve Berkowitz. Steve and I met during Shawn Colvin’s Columbia days. He was her product manager. In 1993 he brought Jeff Buckley to me and the result was the recently released ”You and I”. 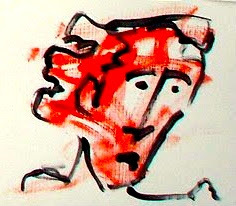 When the idea for “Another Self Portrait” was hatched, the original tapes had to be remixed, I had mixed the B side (“Meet Me in the Morning”, an unreleased version) of “Duquense Whistle”. The Dylan camp liked it and gave me the “Another Self Portrait” project which two years later lead to the mammoth “The Cutting Edge” 18 CD project. EN: You've produced and/or mixed for a lot of great artists including Jeff Buckley, Eric Andersen whom you occasionally perform with, Bobby McFerrin, Suzanne Vega, Olivia Newton-John and others. Can you briefly share a memorable anecdote from maybe three of these experiences? 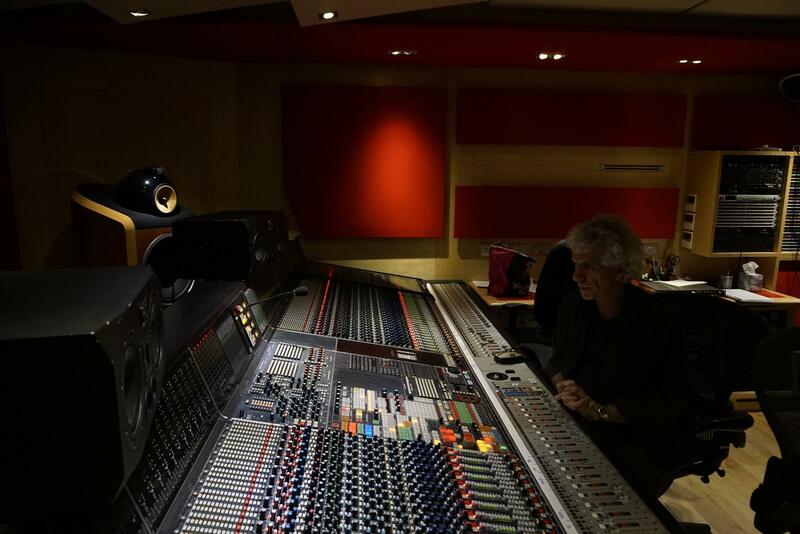 Steve in the mixing room at Abbey Road Studios. SA: During Suzanne’s first album I wasn’t getting the vocal performance I was hearing in my head, so I kept making her redo it. She finally had enough and walked out of the studio but she left her shoes there so she had to come back. I made her put her guitar on while she was singing, which she thought was silly, but it worked. I got two or three vocal takes on different songs that afternoon. 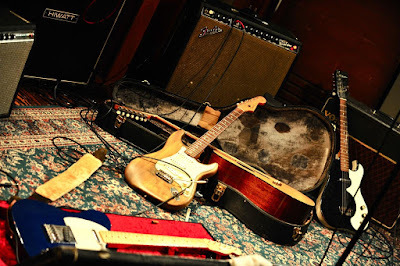 With Eric we had a session booked for Rick Danko to come down and play bass. It might have been for the A Danko, Andersen and Fjeld album. Rick was scheduled for 9 or 10 p.m. He finally showed around 1 a.m. It didn’t matter. As soon as he put on the bass I wasn’t pissed any more. 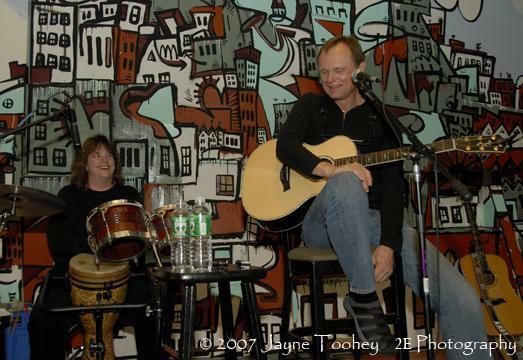 During Shawn Colvin’s first album we had a session booked for Bruce Hornsby to play piano. Bruce has a very distinctive piano sound. Before the session I was concerned on how to get that sound. We put up many different combinations of mics, spending a lot of time prepping for the session. It turns out it didn’t really matter. As soon as he sat at the piano, he sounded like Bruce Hornsby. Lesson learned! EN: What was your favorite aspect of assembling The Cutting Edge bootleg set? SA: Listening to the chatter in between takes and also realizing why Bob Dylan is so amazing. He was always on!!! Even the takes at 4 in the morning when the producer was half asleep. Bob is Bob and will always be Bob! EN: How long have you worked with Eric? What makes Eric such a special person? SA: I met Eric in the late 80’s but had been a fan since his Blue River album in 1972. Eric has always had an uncompromising approach to his music and art. He continues to explore what interests him and doesn’t try to be anyone other than who he is. This is what makes a true artist. We have known each other for thirty years and we still have a great time together whether we are playing a show or having dinner or taking a train. EN: Whose music do you listen to today? SA: I mostly enjoy listening to SiriusXM The Loft, WPKN out of Bridgeport Ct. I don’t spend a lot of time listening when I am out of the studio. It’s a hazard of working in music. When I get home I don’t play a lot of new music. I do enjoy hearing things I haven’t heard before but I don’t have a lot of time to hunt out new artists. There is so much out there, it is hard to weed through it all. Some younger artists I do enjoy include Caitlin Canty and Ana Egge. I can always listen to Mark Knopfler and Jackson Browne. EN: What's your take on the Rolling Stone Top 100 Albums list and other lists like that? What's the real measure of a great album? SA: Lists are a way of categorizing what has been successful, hopefully for the right reasons. In the end like any entertainment business, music has a “what have you done lately” attitude. 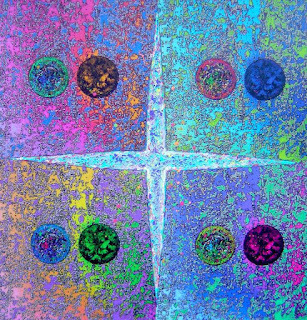 I believe each artist has a core of material that defines them. To sustain that kind of creativity and relevance over a lifetime is nearly impossible. A great album stands the test of time and connects with many types of listeners. How an album achieves that is one of the great mysteries of record production. Songwriting is a very tricky craft and probably the hardest part of the whole business. Without a great song that is finely crafted we have nothing. You do the same things in the studio with different ingredients and once in a long while you get lucky. Eight years ago one of the first artists I interviewed at Ennyman's Territory sold her work on Etsy, the online marketplace for buying and selling all things hand made. The second was Lisa Eddington, an artist in Seattle whose Etsy shop is called lisalego. I believe Christina is the third Etsy artist I've shared here. Picture Book Boutique produces and sells gifts for your favorite little ones, and should probably be bookmarked for all the future baby shower gifts you'll need to purchase over the course of a lifetime. * You don't want to give the same things as everyone else, do you? Picture Book Boutique consists of only original and unique hand-crafted items. The proprietor is Christina Iverson whose young life has included adventures in a dozen countries, and who temporarily lives in Dayton, Ohio. EN: Why is Etsy such a popular platform for selling arts and crafts, etc.? 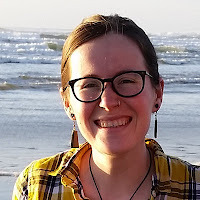 Christina Iverson: I think Etsy has gotten popular because it allows artists to have their products continually on the market, instead of having to go to craft fairs or events where their products are on sale for a limited time. Craft fairs are hard work, and can be expensive with little payoff. Etsy is also affordable; they take a small percentage of your revenue, and a listing fee is just 20 cents per listing. I think the main advantage Etsy has over some other platforms is that it is so organized. While at a craft fair you might not have any customers who are looking for what you're selling, on Etsy, anyone who finds your listing found it because they want to buy something similar. Customers can use the search engine to find specific products, or just browse different categories and subcategories of arts, crafts, as well as craft supplies and vintage items. Sellers can put tags on their items so that people can find them using key phrases. They can also view statistics about how people found their shop or listings, and what items are getting the most views. This helps us know how to advertise more efficiently, and also what types of products to make more of. I was a buyer on Etsy for a long time before I started selling, and often used it when buying gifts. I loved how I could find something very specific that I was looking for, but also could browse categories and Etsy's suggestions for me based on my favorite items, to find new gift ideas. EN: You essentially have three categories of products. Can you describe each and your process of making them? CI: All of my products are centered around children's picture books, so I am looking for ways to recycle picture books and turn them into fun products. This idea is often called "upcycling," meaning reusing a discarded item, and creating a product with more value than the original item. So far I've focused on three categories: blocks, onesies, and framed art. I may end up making other products in the future, but these all seem to be the kind of things someone might buy for a baby shower gift. I've started to find my rhythm with creating my products, and have a process that I generally follow. First I buy picture books at thrift stores and used book shops. I tend to look for classic children's books that people have fond memories of, like books by Dr. Seuss, Richard Scarry, or Beatrix Potter, as well as book series with classic characters, like the Berenstain Bears, Curious George, or Frog and Toad. 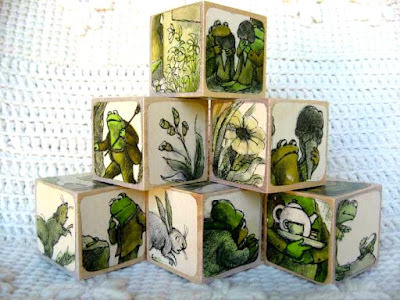 I also look for Little Golden Books and other vintage books that have fun illustrations. When I look through books, first I look for stand-alone images, that I can imagine someone wanting framed or put onto a onesie. After I cut out those pictures, I use the rest of the book to cut out small squares which I put onto 1.5 inch wooden blocks. Depending on the length of the book, I can usually make several sets of blocks and a few framed pictures or onesies from each book. 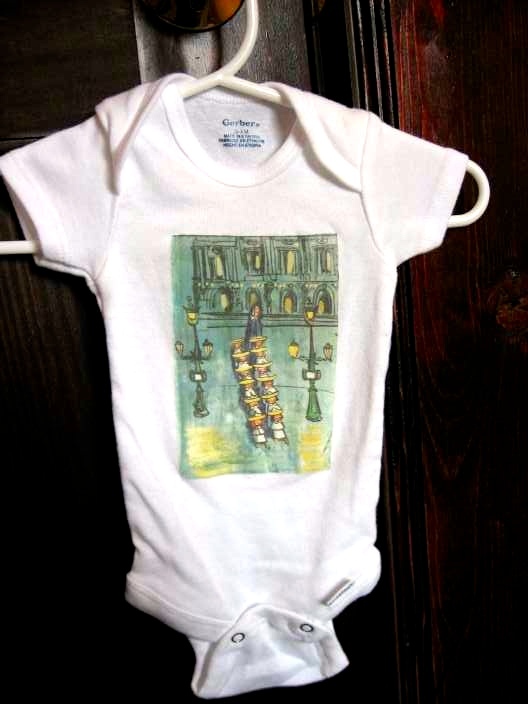 The onesies and framed art are made by using a product called Mod Podge Image Transfer Medium, which is a bit like glue. I cover the picture with the Mod Podge, and set it on the fabric, either a square of plain white fabric, or a onesie. After it sets for about a day, I apply water, and rub off the paper, which leaves the image on the fabric. It looks a little bit like a screen printed shirt. The fabric squares I will frame in hand painted frames that I usually get from thrift stores. 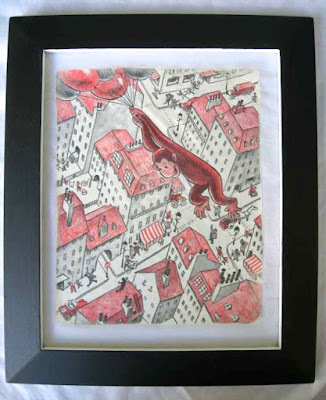 I actually have a fourth sub-category of products, which is framed pages from picture books that aren't transferred on fabric. EN: You have a background that has contributed to understanding this particular market. Can you elaborate on this? CI: I worked as a nanny for 3 1/2 years before starting up my Etsy shop, mostly watching babies and toddlers. I have always loved children's books, and reading to little ones was one of my favorite parts of nannying. Also, as a nanny, I saw a lot of people who were willing to spend a little extra money to have toys that were handmade or had a special meaning. This is especially true when it comes to buying a gift for a baby shower. In a world with so many plastic toys and baby products, I think people want to feel that their gift is a little more memorable or authentic. Customized orders are popular on Etsy, and I have an option for buyers to order a custom set of blocks from any book of their choosing. EN: How did you come up with the idea for the blocks? CI: I actually had seen another shop on Etsy making similar blocks when I was looking for a baby shower gift for a friend. What I've noticed from nannying is that every baby I've ever watched loves blocks! Even when they have lots of toys with all the bells and whistles, babies just love stacking blocks and holding something solid in their hand. I decided to make blocks because I think they're a great toy, and are also something you can use as nursery decor before a baby is ready to play with blocks. I believe most shops that make similar blocks print off images from the internet instead of recycling actual children's books. I think using the actual books makes my products a little more one-of-a-kind. Because I can't mass produce them, each set of blocks is a little different. Using actual books also allows me to make these products without breaking any copyright laws! EN: Why is it important for children to be aesthetically stimulated at this early age? CI: I would say my main intention is more to create a love for books and an interest in reading than to make aesthetically pleasing art. I want children to grow up surrounded by books and to have connections to the books in their toys and art on the walls. Something I've noticed as a nanny is that toddlers love seeing links between pictures in books and those things in real life. I think having toys that incorporate illustrations from books encourages that interest in books and reading. I'm hoping once I make a little more money from my shop, I can sell gift sets, that include a new copy of the book that the blocks or onesie are made from. That said, I do think it's important for children to be aesthetically stimulated, and I think my products have that as an added bonus! I try to pick books with illustrations that demonstrate real talent. *Disclaimer: Christina Iverson, founder of Picture Book Boutique is my daughter. She's been impressively creative in a variety of disciplines since childhood. And I hain't boastin'. Just sayin'. Why Is Virtual Reality Something We Should Be Worried About? This past week I picked up a book of essays that have been bound together under the title, What Should We Be Worried About? The book is filed in a section of the library dealing with futurism, artificial intelligence and similar themes. 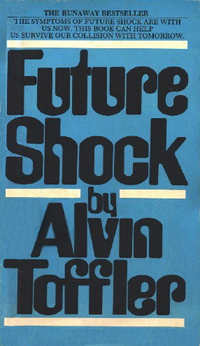 Futurism is a theme that has interested me on and off as far back a Toffler's 1970 classic Future Shock. In fact, that period of history was awhirl with books on Armageddon and the end of the world. Population Bomb, The Late Great Planet Earth and the findings of the Club of Rome were just a few of the high profile titles. This book is a bi-product of The Reality Club that John Brockman formed in 1981, which evolved into a new face called The Edge. It's a place where intellectuals and scholars can explore ideas. In 2014 the idea they explored was this one: What should we be worried about? With nearly 500 pages of short essays, many by people familiar to the broader public, there's plenty of material to chew on. It would be a great book for late night college bull sessions (if kids still do that sort of thing) or for philosophy club discussions. What's this world coming to? Inquiring minds want to know. Earlier today I pulled a page from the January/February edition of Popular Science because it contained an article and infographic titled Virtual Reality Gets Real. The graphic provides a timeline of key VR milestones from the past (1992's Sensorama Simulator) to the future where people could develop bonds with virtual humans. In 2002 VR was already being used to help people with PTSD. 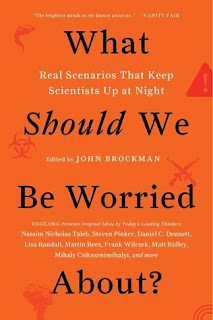 This book from the Edge has an essay by Milhaly Csikszentnihalyi that begins with his pointing out that it doesn't take much imagination to think of many things to be worried about tomorrow. Ultimately he selected The Triumph of the Virtual as his theme. His big fear here is that children will grow up to be adults without the ability to differentiate between reality and imagination. What will be the effect on democractic societies? Of course the case can be made that television has been a medium for distracting rather than informing the masses, for manipulating rather than mobilizing us for good. The dark side of VR is more potent than just an occasion for pornographic sideshow circus fairylands. Another essay in this book discusses the darker aspects of technology as it related to the formation of children's minds and perceptions. VR has been getting extensive publicity this year since the CES Show in Vegas and especially in light of the purchase of Oculus VR by Facebook. One result was that I headed over to Best Buy recently to see what those VR Goggles looked like. What I saw looked undramatic at best, especially compared to the GoPro videos that produce such visually stunning images, especially when mixed with imagination. (I love the GoPro vid taken from the shoulder of a bald eagle in flight. My guess is that there's a fairly massive hunger being created for the possibilities of VR. What will happen in this field will be anyone's guess, and we're sure to find out. That is, unless some of the other fears outlined in this book come to pass. What is it that keeps you up at night? This past two weeks I've been carrying this song around in my head, letting it swirl, percolate, produce something to share here. As Dylan fans know "I Dreamed I Saw St. Augustine" appeared on his John Wesley Harding album, his first album of new songs after the infamous motorcycle accident that terminated his world tour with The Band. What was striking about the album was how it signaled another change in direction for Dylan as an artist. His previous three albums rocked a lot of foundations and shook up a lot of the fans he'd acquired during his folk days. Now, it was a scaled back sound that featured simple tunes, an acoustic guitar and harmonica. John Hinchey called this album the "comeback of all comebacks." In describing it, he cites Dylan's own comment on comebacks from Love and Theft: "You can always come back, but you can't comeback all the way." Perhaps this was considered a comeback only because he'd come out from a long period of silence, veiled from the public eye. This song was the third cut on side one. Interestingly, he performed it 39 times between 1969 and 2011. As many writers have pointed out, "I Dreamed" opens with a tune and structure similar to the classic folk song about the union organizer Joe Hill. "I dreamed I saw St. Augustine, alive as you or me"
Compare: "I dreamed I saw Joe Hill last night, alive as you or me..."
It's easy for me to hear Joan Baez singing that line as it rises, whereas Dylan's version, with similar cadence, falls at the end of the line. What we hear in this song is a tale about a strange dream featuring this significant fourth century theologian/philosopher tearing about "in the utmost misery with a blanket underneath his arm and a coat of solid gold." The blanket is a symbol of comfort, the gold a symbol of purity and perfection, not earthly wealth. As the Proverb states, "The crucible is for silver, the furnace for gold, but the Lord tries hearts." In the narrator's dream, St. Augustine is searching for souls. The second stanza elaborates on why Augustine is so concerned. 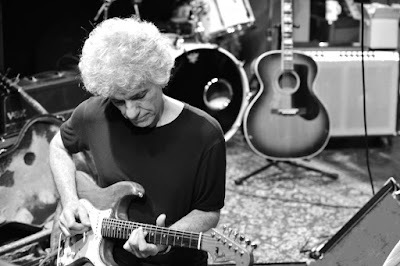 David Pichaske, in his Song of the North Country, writes "John Wesley Harding is pervaded with sin and redemption, and associated with concerns for the health of the soul." Of this song Pichaske notes that the singer is "lamenting the death of prophets and martyrs in this modern American wasteland, and offering his own message of comfort: 'Know you're not alone." The third verse comes with another twist. In the narrator's dream he discovers that he is amongst the ones who put the martyr to death. When he wakes, he is shaken to the core. At this point it would make a good segue to do a little study of the various dreams by which God spoke to characters in the Bible, from Jacob and Job to Jonah and Joseph. But that's a study you can do on your own. My thoughts this morning fall into alignment with another book I'm reading, Francis Fukuyama's Our Posthuman Future. The question of the moment is this: what does it mean to be human? What does it mean to have a soul? The questions have been generated by recent reading about robotics and artificial intelligence. (AI). In 1980 I wrote a paper analyzing contemporary culture, attempting to bring order from the chaos of our times. On pages 22-25 I spotlighted two of the most influential dystopian novels of the previous fifty years, Orwell's 1984 and Huxley's Brave New World. Despite the the seemingly disparate images of our future -- a totalitarian state so complete that Big Brother is everywhere vs. a ghastly, genetically pre-programmed human race where artificial happiness reigns -- the two "visions" of the future have something in common. Both point to a dehumanized humanity, devoid of mind, will and emotions and soulless. If everyone can be happy, what's wrong with this picture? Leon Kass states, "Unlike the man reduced by disease or slavery, the people dehumanized a la Brave New World are not miserable, don't know that they are dehumanized, and, what is worse, would not care if they knew. They are... happy slaves with a slavish happiness." What does it mean to be human? What is it that sets us apart from the rest of creation? Conscience is part of it. How we treat our brothers and sisters is central to it. All this is tied, as theologians explain it, to the imago dei, the image of God in us. But many modern scientists deny the existence of this part of our species. Instead religious experiences, they suggest, are generated by our own genetic dispositions. It's nothing more than a illusion, albeit compelling. Fukuyama argues that this corrosive postmodern smog was foretold by C.S. Lewis in his Abolition of Man (1943). Lewis saw what was happening in public education which had begun teaching relativism and the denial of objective truth. Huxley only detailed the manner in which this de-humanizing would occur. Dylan keyed into the matter of conscience in a number of songs on this album, including Dear Landlord, I Pity the Poor Immigrant and this one, among others. I appreciate the straightforwardness of its simple ending. When the narrator of I Dreamed awakes he's shocked, saddened, broken by what he's seen. He's seen himself. Fukuyama's concerns here are how features of contemporary biotechnology need to be given ethical restraints before the real damage is done. It's not just about the side effects of pharmaceuticals that should concern us. What Huxley predicted in the 40s is unfolding faster than anyone back then could have imagined. The frightening part is that what's taking place in biotechnology and pharmacology is so nuanced and complex that we don't even know how to argue against it. The "progress" taking place in these and other fields, like neuroscience, genetic engineering and A.I., will change us in ways we can't fully foresee and with benefits that no doubt create other unintended consequences. My thoughts here are full of loose ends. Just trying to sort something out, I suppose. For more on the significance of Augustine, visit my 2009 blog post here. The quote above is a favorite of mine. Interestingly enough, it's the first thing that comes to mind when I think of poetry, and the poetry culture that has evolved here in the Northland. It's probably no accident that Duluth became the first city in Minnesota to have an official Poet Laureate. What's happening here in the arts and culture is pretty exciting, probably that would be lost in a major metro like the Twin Cities. Add to this the pristine natural riches we have here with the lakes, hills hiking trails, biking trails and more. So it is with pride that I note this announcement that applications are now open for the selection of the 2016-2018 Duluth poet laureate. Here are the details, courtesy Jim Perlman of Holy Cow Press! 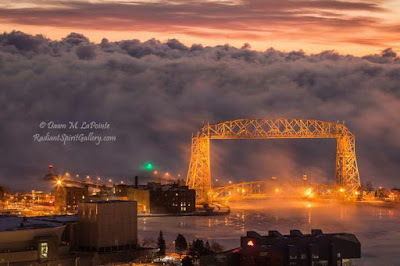 Poets who have lived or worked in the Duluth, Minnesota area for five of the past ten years, and who provide the requested application materials according to the guidelines, are eligible. 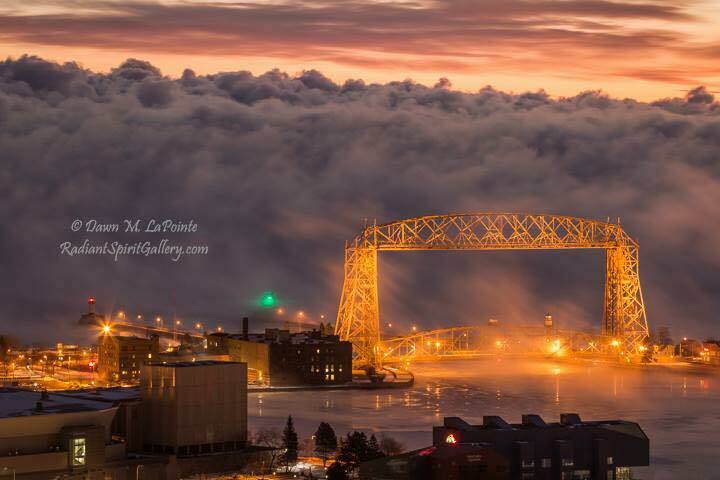 Applicant poets must live in Duluth or within 30 miles of Duluth in Minnesota. The 2016/2018 Duluth poet laureate will be selected by a committee of representatives from Duluth's literary community, related businesses, colleges and universities and those interested in the field of poetry. 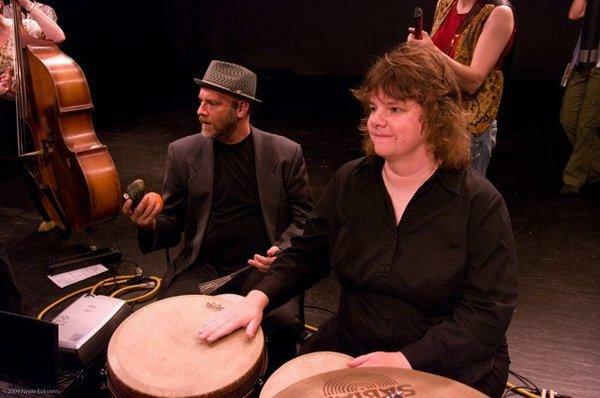 The Duluth Poet Laureate project was established in 2005; Barton Sutter was chosen as its first poet laureate in 2006; Jim Johnson was selected as Duluth's second poet laureate in 2008, Sheila Packa in 2010 and Deborah Cooper in 2012. Jim Johnson returned for a second term as 2014-16 Duluth Poet Laureate. Since the establishment of this award, several Minnesota cities have selected poet laureates, including Saint Paul, Red Wing , Rochester, and Winona. Robert Bly was appointed Minnesota's first state poet laureate in February, 2008; Joyce Sutphen was appointed in Fall, 2011 as Minnesota's second state poet laureate in recent times. The 2016-2018 Duluth Poet Laureate will be awarded a $3,000 honorarium for a two-year term. Funding for the poet laureate project is provided by area organizations who are represented on the poet laureate selection committee. Applications guidelines and more information about the 2016-18 Duluth poet laureate project are available by writing to: Duluth Poet Laureate Program, 711 Woodland Avenue, Duluth, Minnesota 55812, or by e-mail: holycow@holycowpress.org. Copies are also available at the main branch of the Duluth Public Library, information desk, 520 West Superior Street, Duluth. The application deadline for the 2016/18 Duluth Poet Laureate program is September 2, 2016. A crowning ceremony and reception for the new Duluth poet laureate will take place in October, 2016. I know who I would vote for. Then again, there is so much talent in this community. I know I'm biased, but here's what I have to say: Duluth, you Rock. For a good read, visit my blog post titled Whitman, Dylan and Me: Uncanny Connections. Throwback Thursday: My First Attempt At Standup Comedy. So I did a short stand up routine last night at the Dubh Linn, an Irish Pub here in downtown Duluth. It was "open mic" night, which they do every other Monday I guess. I've been scribbling ideas for comedic material the past month since getting bit by the bug. My goal was to assemble a modest routine and take a stab at it in January. But hey, things don't always go as planned. When I walked into the room, the MC asked if I were going to perform. It seemed like I was the only one there who wasn't, so I caved in. That's how peer pressure works. Sometimes when you have insomnia your mind travels down rather amusing tributaries. One night, while doing a little mental rambling, I began cultivating humorous anecdotes about my various scars. I figured that if I talked about my scars it would be enough material to fill a routine. My real aim was just to see what it was like standing on the stage with a bright light in your face. It's a little different than your living room. More like an interrogation scene at a 1950's cop station. I began with that very painful scar which I received on my heart when my father called me stupid in front of the whole neighborhood. Actually, I introduced this story by talking about the Darwin Awards, which are famously given to people who do really dumb things and eliminate themselves from the gene pool. Well, in listening to an audio book about the fourth annual Darwin Awards, the very first story is about a guy who jumped out of a moving car. Whoa. Now, you probably think that's stupid. He was killed, and it was certainly a dumb thing to do. But when I did it, and I was twelve at the time, jumping out of a convertible on the way home from a Little League game, when I did it, it sure didn't seem that stupid to me at the time. I just thought I would hop right out and trot up onto the yard and say hello to the girl I liked and I would be very cool. To my surprise, I slammed into the asphalt like a wet noodle being whipped against a table. Except there were these large limestone rocks and gravel there, which made the experience a tad less palatable. It was at this point that my father came running across the yard shouting, "You stupid!" Followed by a less shrill, "You could have been killed." About forty-five years later, I'm ready to acknowledge that sometimes dads are right. Duh. It took me quite a while to get over that emotional hurt. Needless to say, I don't think Robin was as impressed as I'd hoped she would be. As for the rest of my scars, or rather, my routine... Well, according to the limited feedback I received I have to shorten my setups. I could also probably use some punch lines. Some funny material would help a little, too. Do you have a funny story you'd like to share? What's the stupidest thing you've ever done that you're willing to talk about? If you're reading this, I'm happy that it didn't kill you. The current exhibition of photographs by Tim White now hangs in the John Steffl Gallery on the balcony level of the Great Hall in the Depot. The juxtaposition of photography and text created impressions that enhanced the power of the imagery, an almost chimerical sensation that at times produced an unexpected, beautiful melancholy. A few photos taken during Thursday's opening, which also included a Family Art Night Out for the community. the last word out of my mouth was "happy"
Note: the new Lakeside Gallery is opening this Saturday the 25th. Look for Grand Opening details here on their Facebook Page. He keeps on rollin' along. This spring a project was announced regarding the 192-mile waterway that pours itself into Lake Superior here beneath the hills of Duluth, the St. Louis River. Strangely enough, when I got transplanted here 30 years ago, I somehow thought this river was related to city of St. Louis, which didn't make sense. It flows north into Lake Superior, and how could it flow south at the same time? I eventually figured it out. The project's aim was to have writers and journalists tell stories about the river during a one month period, and to share those stories via social media. The stated purpose, as I understood it, was to get our regional writers working together on a single theme. Too often all the news media, print and television, compete to scoop one another rather than share information. The project actually began the year before, though it as yet did not have a name. Again, this was how I then perceive the efforts to pull local writers together in an experiment in networked journalism. My commentary on that first meeting ended with the observation, "It waits to be seen how the seeds from this hour-long program will take root in the minds of our various local journalists." Like all things that emerge into public view there is always a backstory. Here at Perfect Day Duluth is a good summary of how the One River, Many Stories project was given birth. “One River, Many Stories” is a journalism, media and storytelling project and resource hub for journalists, educators, and citizens to foster deeper conversations about our community. This University of Minnesota Duluth Journalism program project is funded in part by the Knight Foundation Fund of the Duluth Superior Area Community Foundation. Any thoughts you have on the project, your writing and contributions, etc. would be welcome. Once you begin to notice, you'll find rivers in all sorts of places you maybe didn't expect. They've been a part of my life from early memories to the present. And they've played a significant role in all facets of human history from the river that watered the Garden of Eden to the river of the water of life that flows in Revelations 22. And then there are the multitude of stories in between about rivers in history books, literature, science and the arts. Great books that feature rivers include Norman Maclean's A River Runs Through, Mark Twain's Huckleberry Finn, Nobel Pize-winning author V.S.Naipaul's A Bend in the River, Thomas Wolfe's Of Time and the River, Annie Dillard's Pilgrim at Tinker Creek, Joseph Conrad's Heart of Darkness and Herman Hesse's Siddhartha. This past year I began an interesting book called River of Doubt about Teddy Roosevelt's journey up the Amazon. Hollywood films featuring rivers include Deliverance, The African Queen, Apocalypse Now and The Man from Snowy River, among a host of others. Rivers used to be the highways of commerce, until trains, planes and automobiles got involved. When Abe Lincoln was a young attorney in Illinois he represented a case which involved the construction of a railroad bridge across the Mississippi in which steamboat interests were pitted against the emerging railroad industry. The case involved the building of a bridge and had commercial ramifications that are echoed in our own river's story to some extent. What was this river project all about? And what did I really gain from being part of it? Some of what I learned included a strong awareness that there is a fairly substantial herd of talented writers in this region, not that I was surprised. The event in which journalists discussed the impact of the Polymet project showed me that our local journalists have some pretty challenging roles to play that are vital to the community. Even though my personal memories of the St. Louis River are limited (though probably many more than I shared) I myself connected to the project because rivers in general have been a part of my life in many ways. My impressions of the project? It gave me an opportunity to reflect on things I may not have taken time to reflect on otherwise, being immersed in so many other projects. In this case I began as an observer, like fans in the stands who watch to see what the players on the field will do. Somehow I ended up in the game. It also gave me a chance to see why that Native American community is so woven into this community, in contrast to the East Coast community where I grew up. There the pre-history of European settlers was hundred of years ago, and the native influence has been subsumed. Here, a rich native culture existed a mere hundred-fifty years ago, and has not been subsumed. Many in the arts scene especially appreciate this rich contribution of heritage. So it was that the project One River, Many Stories had two hashtags for accumulating the social media expressions related to this project: #OneRiverMN and #ChiGamiiziibi. For personal reasons I can't help but comment on the unusual disposition of the river as a connector between Duluth and the Iron Range. Bob Dylan began his life in Duluth and in his sixth year the Zimmerman family (his birth name) moved to Hibbing on the Iron Range. The headwaters of this river are on the Iron Range. The river follows a circuitous route to Duluth where it runs into the vast expanse of "the open sea." One wonders if maybe this is one of the rivers where Bob watched the river flow. Meantime, life goes on.... flowing like the great river that it is, sometimes gentle and comforting, sometimes turbulent, always inspiring, never the same. Thank you to the One River, Many Stories project developers for sharing your idea with our writers and region. The new space is light and inviting. Ten days ago there was a grand opening reception for the re-opening of the Tweed Museum of Art on the campus of UMD here in Duluth. I missed it. I was on a plane headed east to the wedding of a niece. Fortunately, I had the opportunity to visit on Saturday afternoon and the everything looks great. Word on the street is that the best time to see the art at the Tweed is to avoid the receptions and go on a Saturday when the museum is quiet and you have room to situate yourself in front of the various pieces and study them. (The receptions are for fraternizing with the artists, who do not live in the galleries, and for catching up with friends.) This month's re-opening was especially jammed so it became almost impossible to move, or see the art. But that's also great, seeing that the museum has a lot of friends of the arts. Being the special occasion that it was there were speeches by Ken Bloom, by Duluth Mayor Emily Larson, museum curator Dr. Karissa White and others, as well as special music by the Sound of Strings Duo. Unlike other opening receptions at the Tweed, which are coordinated with various exhibitions, this event kicked off a total facelift for the walls of all exhibit rooms including the main hall and balconies. It's a must see for this summer if you've got any free time at all. Jeffrey T. Larson, classic self portrait. There are three new exhibits on display at this time. Domestic Space is a large collection of paintings by super-realist painter Jeffrey T. Larson. All This Is True is in the section usually utilized for student exhibitions. 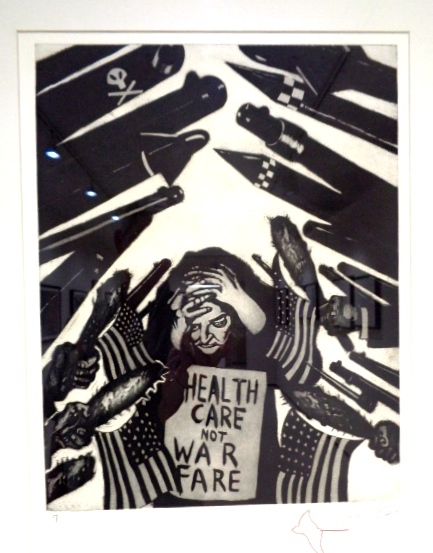 The works by Coe and Colescott are political, imaginative, thought-provoking and shocking. Upstairs on the balcony area is Vance Gellert's Iron Country. Gellert is a photographer, and his lens is pointed to sites and scenes on the Iron Range. The new Tweed space is light and inviting. Its collection has nearly 8,000 pieces, and one begins to see the depth when they rotate all the walls like this. There is much to see. It's clearly a major undertaking, but has been worth the wait. Much more can be said about the new look of the Tweed and the current exhibits, but we'll save that for another time. Do take part of an afternoon to check it out. It's a real gift to our community to have an art museum of this caliber here. Thank you to all who make it happen. This past year a friend has been prodding me to learn more about Artificial Intelligence (AI) and as a result I've been reading a number of good books on this subject. One of the best that I found recently was Surviving AI by futurist and AI commentator Calum Chace. 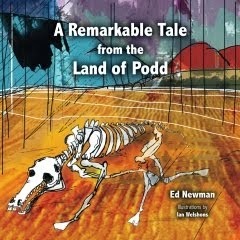 The title of the book is interesting because there are few of us unfamiliar with the story of Pandora. Yet how familiar are we really? We remember that Pandora opened the box that permitted all manner of evils to enter the world, but do you know where she came from in the first place? I'd venture that very few of us are intimately acquainted with the details of that story, or how it relates to AI. Chace's new book, The Economic Singularity, focuses specifically on economic impact of AI. In the first half of the book he synthesizes all the various points of view on how AI will play out, citing all the leading experts in this field who are thinking about these things. Computer advances are happening so fast it would make grandpa's head spin. And change will only get faster. What differences will it make? Is AI a friend who will make life easier? Or a foe to be feared? The book will be available for purchase within about a month. EN: In your new book you spent several pages on "the Luddite Fallacy." Can you sum that up very briefly here. It was insightful. Calum Chace: The Luddites is a name given to people who smashed machines in England in the early nineteenth century because they believed the machines were rendering them unemployed. Their name came from a man called Nedd Ludd, who might not actually have existed, and was supposed to have broken a machine by accident. The English government reacted viciously, rounding up suspects more-or-less at random, and executing some, sending others to the penal colonies in Australia. Economists are also rather vicious to the Luddites, pointing out that automation has not so far led to widespread unemployment, but has instead produced economic growth, and hence more jobs. They dismiss fears of automation-led unemployment as the “Luddite Fallacy”. In fact there was a period in the first half of the nineteenth century when economic returns to labour fell behind the returns to capital, probably because of automation, which means that unemployment probably did rise somewhat. This is known as the Engels Pause, but it ceased around the same time as it was noticed by Friedrich Engels, Karl Marx’s collaborator on the Communist Manifesto. The big question is whether the new round of automation, where machines take over cognitive jobs, will cause lasting human unemployment. I happen to think that it will, and that if we are smart it can be a very good thing. 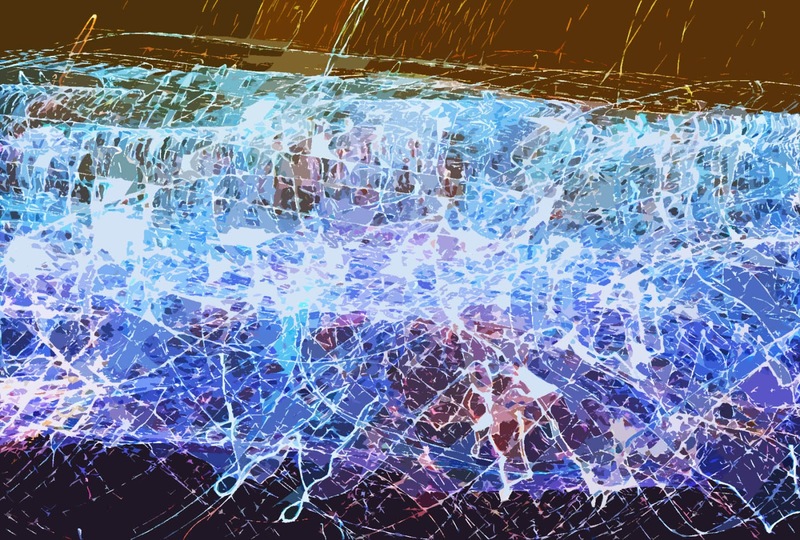 EN: The Economic Singularity addresses the impact A.I. will have on society and states it will be "the death of capitalism." In order to have a positive outcome in the transformation of our economic systems, won't we need a better political system as well? Will the U.S. lead in this or will such leadership come from somewhere else in the world? CC: If we need a new economic system we are likely to need a new political system, too. Technology will also probably enable all sorts of new types of politics, including more direct forms of democracy than we have at the moment – although the UK’s current EU referendum suggests that on that front we should be careful what we wish for! I do expect the US will have a leadership role, not least because it is the home to the six big tech firms that are leading the way in cutting-edge AI: Google, Facebook, Microsoft, IBM, Amazon, and Apple. China also has three: Baidu, Tencent and Alibaba. But the changes will probably sweep across the developed world very fast, and the developing world will catch up quickly, too. EN: What are some books you would recommend for people to get up-to-speed on what is happening in A.I.? CC: The leading textbook for AI as an academic discipline is probably still Artificial Intelligence, A Modern Approach by Stuart Russell and Peter Norvig, but what mainly interests me is not AI as a science, but its impact on society and on individual humans. Ray Kurzweil is controversial, but his book The Singularity is Near is definitely worth reading, and Nick Bostrom’s Superintelligence is a must-read. People tell me that Surviving AI by some bloke called Calum Chace is an easy way into the field. EN: If someone has school-aged children, what would be your recommendations for preparing them for the future they will inherit? CC: If you’re lucky, get rich. If you’re smart, get into Deep Learning. (That will also have the benefit of making you rich.) For the rest of us, get a broad education in both science and the humanities. If we make a successful transition through the two singularities (technological unemployment and then superintelligence), then you’re probably going to have a very long life with lots of possibilities, and you’ll enjoy it better if you have a well-stocked mind. EN: What authors do you personally align with as far as envisioning the future? CC: Science fiction doesn’t usually forecast the future. It rarely makes accurate forecasts, and in fact it rarely tries to. But it does a great job of envisioning possible futures, and that is very valuable. My two favourite science fiction authors are Greg Egan and Ian M Banks. 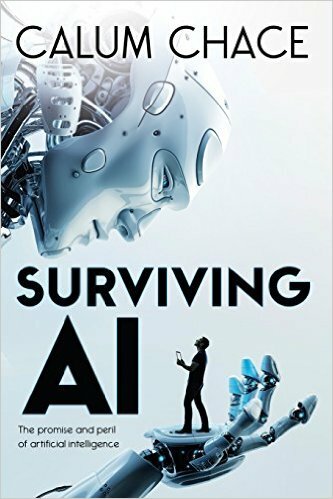 The cover of The New Singularity is a companion piece to the earlier book Surviving AI, both book covers designed by Rachel Lawston. The concept is intriguing. The illustration shows a large robot studying with wonder a human who is standing in the palm of its hand. The implication is that the power is massive and humankind is dwarfed by it, yet looking up in awe of it. The cover illustration for the new book echoes the first, except that the human is reclining in something akin to a lawn chair or deck chair. The power disparity remains the same, but the human is at rest within the new context. 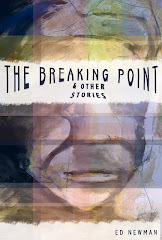 For what it's worth Chace offers a free story to people who sign up for the Pandora's Brain eNewsletter. The story I received was titled Fermi, a sci-fi story that examines a new possibility about the nature of reality. It's a fun read. I myself have long been interested in these kinds of stories about the nature of reality. 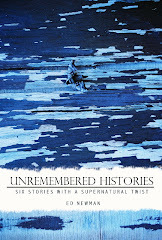 A few of them have been assembled in a short collection call Unremembered Histories, which is available (like much of the world's goods) at Amazon.com. As we plan for the future, it is helpful to know where we are. Chace's books provide insights about where we are in terms of the technological features of the world we live in. They make accessible ideas that will be useful for understanding the future we are on the threshold of entering. Meantime, life goes on all around you. Engage it. Was Ringo a Starr? Oh Yeah.